An illustration for the book, “Battle of Bellewaarde – June 1915” by Carole McEntee Taylor. 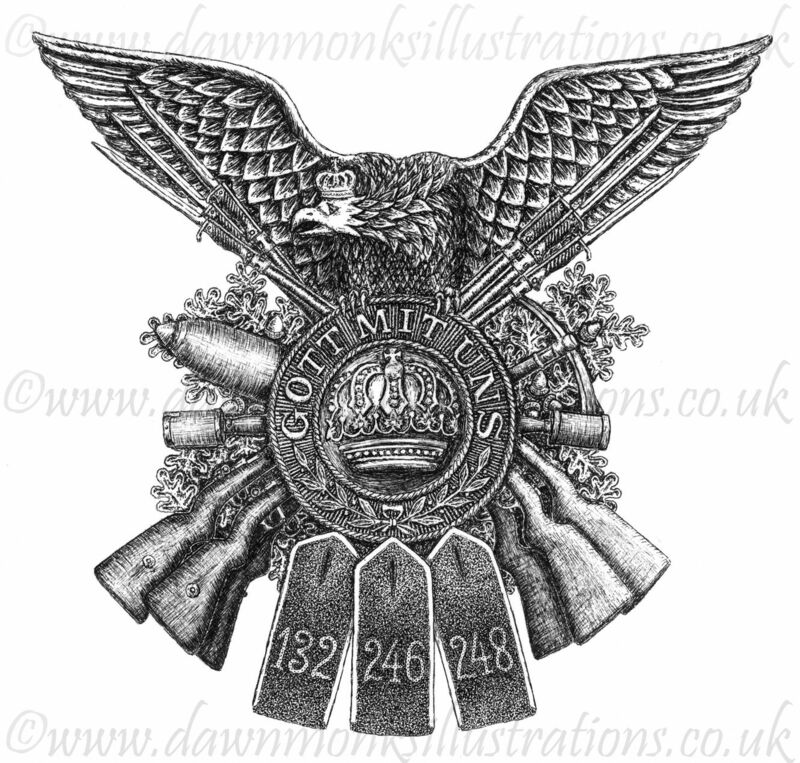 This chapter heading illustration in pen & ink for the German regiments gave me a little more freedom to be creative than simply drawing British cap badges, which I’d used for the other chapters headings in the book (see the Cap Badge Illustrations page). The image was to represent the three regiments of the German soldiers that took part in the battle and was therefore rather less straightforward than for the British – the German helmet plates were specific to region rather than individual regiments, but each regiment did have numbered shoulder boards corresponding to the number of the regiment. The challenge was to create something that would hold its own alongside the ornate beauty of the British badges. The design is loosely based on a divisional image from a German WW1 trench magazine, and I hope that it gives a suggestion of stern Teutonic pride. The image is available to purchase as a bone china mug or T-shirt design.